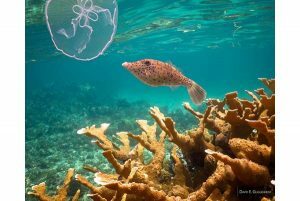 A trunkfish nibbles on a moon jelly above a stand of healthy elkhorn coral (Acropora palmata) in the Punta Frances marine protected area, part of Cuba’s Isle of Youth. If you search Wikipedia for significant events that happened on June 11, you’ll find nothing for 1997. The Michael Jordan-led 90-88 victory of the Chicago Bulls’ over the Utah Jazz that day didn’t rise to the level of a Wikipedia entry, but something else should have. That afternoon, something monumental took place on a large island just 90 miles off the Florida coast: Cuba’s National Assembly of People’s Power passed a remarkable piece of legislation known as Law 81 of the Environment. The legislation created Cuba’s environmental ministry and elevated Cuba to an environmental leader. The law is based on a foundation of exceptionally powerful tenets, including formal recognition “as a basic right of society and its citizens, the right to a sound environment, and to the enjoyment of a healthy and productive life in harmony with nature.” The 1992 Rio Summit convinced Fidel Castro to go green and Law 81 followed. Ocean Doctor president, Dr. David E. Guggenheim is a contributor to The Oxygen Project, which generates awareness and promotes lifestyle changes necessary to ensure prosperity for generations to come. Our work is difficult and urgent. We need your support to help protect and restore coral reefs in Cuba and the Caribbean. Join our cause!